Picking up the pieces What is the legacy of the Arab Spring? In December 2010, a street vendor by the name of Mohammed Bouazizi set fire to himself. 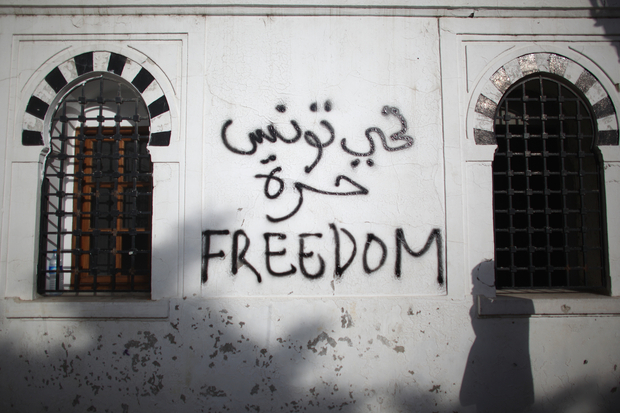 This unleashed a wave of protests that unraveled from Tunisia across the Middle East and North Africa. It seemed as if the times of tyranny in the most despotic region of the world had come to an end. Yet four years later, all that is left seems worse than before. Protesters venting their long-suppressed grievances in protests whose subsequent turmoil led to trajectories from civil war and chronic instability in the cases of Syria, Libya, and Yemen, to reconfiguration and repression, as for example in Egypt, Morocco, and Bahrain. Even Tunisia, seemingly the one exception, has elected parts of the ancien régime back into power (although this time they've been democratically elected). The role of the democracies in Europe and across the Atlantic during this period of upheaval has been controversial to say the least. First they staged a NATO airstrike intervention against the Gaddafi-regime in Libya and then left the country to itself in the aftermath. At the same time Western politicians willingly closed both eyes to the Gulf states' intervention against peaceful protesters in Bahrain. In Syria, the West kept watching one of the most dreadful crimes against humanity since Rwanda from the sidelines but intervened against the Islamist fundamentalists of ISIL because they were, and still are, perceived a threat to international security - while Assad only constitutes a threat to Syrians. Inviting the new military pharaoh of Cairo to Europe's capitals to sign arms deals while the Mubarak regime was absolved of all sins and the protesters whom the West applauded in 2011 are jailed and sentenced to death in mass lawsuits. Applauding the King in Morocco for his stable path towards democracy while he cracks down on protesters, critical artists, and journalists just after the mass protests stopped. The list goes on and on. Until 2011, the majority of the population was subordinated under those tyrants ruling their states as if it were their birthright to rule while milking the state for their own benefit. Even if most of the uprisings have not led to democratization, the perceptions and expectations with regards to rule, authority and subordination have changed. The majority of the population - consisting of people aged 25 and below- have seen that they can change something through raising their voices and taking their grievances to the streets. This has changed the social contract between the rulers and the ruled in many ways. In many countries, an active civil society has come to occupy a new space in the political sphere. The Internet's emergence as a space for political debate and citizen journalists covering crimes conducted by the state and its henchmen indicates that new practices of political contestation have emerged and are enduring. Even though the West did not play a laudable role during the events of 2011 and thereafter, politicians in Europe and beyond have been looking at the Arab world differently since 2011. Although it seems many Western politicians have returned to the old doctrine of favoring stability over democracy in the region, they are now aware that stability comes with a price tag: foremost, the decline of the West's moral credibility in the eyes of the region's oppressed people.